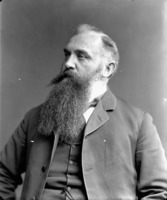 WATSON, JAMES CRAIG, astronomer; b. 28 Jan. 1838 near Fingal, U.C., the eldest son of William Watson and Rebecca Bacon; d. at Madison, Wisc., U.S.A., 23 Nov. 1879. William Watson left his farm near Fingal in 1850 and the family settled at Ann Arbor, Michigan, where James Craig entered high school and, later, the University of Michigan. His lifelong interest was in celestial mechanics, the branch of astronomy that deals with the determination and nature of the orbits of heavenly bodies. He was well suited for such work, being an exceptionally keen mathematician and a rapid, skilful computer. He had also considerable mechanical ability: he supported himself in high school and university by working as an engineer in a factory. At Michigan, his ability developed rapidly under the guidance of his teacher, the eminent astronomer Franz Friedrich Ernst Brünnow. After graduation in 1857, he was appointed assistant in the observatory (1858), professor of astronomy, and, in Brünnow’s absence in 1859, acting director of the observatory. He was made professor of physics in 1860. When Brünnow left Michigan in 1863, Watson was appointed his successor as director. Three weeks after his appointment, Watson discovered the first of the 22 asteroids that were to be associated with his name. As an aid to such discoveries, he spent many years preparing a series of ecliptic star maps, but the project was never completed. A result of his interest in asteroids was his publication Theoretical astronomy (1868), an authoritative treatise on orbit determination which remained a standard text for many decades. Watson also wrote A popular treatise on comets (1861) and numerous scientific papers. He received many awards, including three honorary doctorates. Watson, like many astronomers of his day, participated actively in eclipse expeditions (Iowa, 1869; Sicily, 1870; Wyoming, 1878), and he also led an expedition to observe the transit of Venus (Peking, 1874). At the 1878 eclipse, he became interested in the possible existence of an intra-Mercurial planet. He believed he had observed one, and devoted considerable effort to calculations which would aid in the verification of his observation. Unfortunately, his calculations were never published, and his observation never verified. In 1879 Watson became first director of the new Washburn Observatory at the University of Wisconsin in Madison. In this position he carried out his duties with vigour, efficiency, and care, and he showed the utmost concern for the welfare of his colleagues and students. While engaged in the supervision of the construction of the observatory, he became ill, apparently of exposure, and died suddenly on 23 Nov. 1880. He was survived by his wife, Annette Waite, whom he had married in 1860. There were no children. In a sense, Watson’s interest in asteroids transcended his death, for he left a sum of money, deposited with the National Academy of Sciences, to finance the computation of tables that would assure his asteroids would never become lost to the scientific world. To the author’s knowledge, Watson’s asteroids are the only celestial bodies so endowed. James Craig Watson was the author of A popular treatise on comets (Philadelphia and Detroit, 1861); Tables for the calculation of simple or compound interest . . . (Ann Arbor, Mich., 1878); and Theoretical astronomy . . . (Philadelphia, 1868). DAB. G. C. Comstock, “Biographical memoir of James Craig Watson,” National Academy of Sciences, Biographical Memoirs (Washington), III (1895), 45–57. W. J. Hussey, “A general account of the observatory,” Astronomical Observatory of the University of Michigan, Pubs. (Ann Arbor, Mich.), I (1912), 3–6. B. L. Newkirk, “The Watson asteroids,” Popular Astronomy (Northfield, Minn.), XII (1904), 645. John R.Percy, “WATSON, JAMES CRAIG,” in Dictionary of Canadian Biography, vol. 10, University of Toronto/Université Laval, 2003–, accessed April 20, 2019, http://www.biographi.ca/en/bio/watson_james_craig_10E.html.